The SCS RAPID column system allows the column and pier cap to be poured at the same time as the foundations - on site or at another facility. The system has a foundation embed which can be a ordinary moment connection, a SDD moment connection or a nominally pin connection as shown in the example below. Because the concrete curing of these components occurs in parallel, months of time can be saved over conventional cast-on-site construction. The column assembly consists of a reinforced concrete column with end plates that anchor the interior reinforcing bars at the ends. If specified, the SDD core is cast with the column assembly. 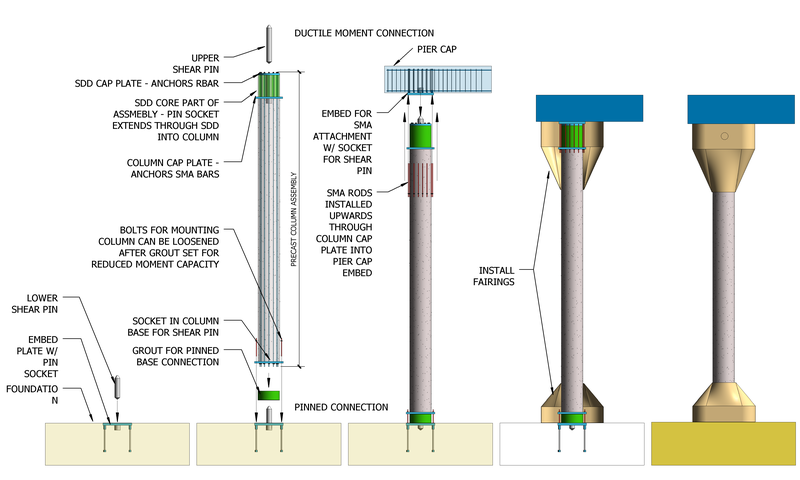 Prior to setting the column on the foundation embed, a shear pin is inserted into the socket in the foundation embed. This provides a low-moment capacity, high shear capacity connection and, due to its tapered shape, helps align the column onto the foundation embed. If an SDD is used at the bottom, its core would be a part of the bottom of the column assembly. If the connection is an ordinary moment connection or a pin connection, this core can be precast as a part of the assembly or be field poured to assist with plumbing of the column. The foundation setting bolts for the pinned condition shown can have the nuts loosened or removed after grout set to eliminate undesired restraint. Once the column assembly is set, a shear pin is installed in the top of the column assembly. Like the bottom shear pin, it provides shear restraint and helps align the cap onto the column. An optional thin bearing pad can be placed between the pier cap plate and the SDD cap plate for uniform force distribution. Once the pier cap is set, the anchor bars or cables are installed upwards from the bottom with nuts on the bottom of the column plate only. Thus, when the column moment places the bars into compression, they simply slide through the holes in the plate. Once the pier cap is set and the SMA rods installed, instrumentation is installed where it will be covered by the fairing. Construction inspection can be finalized and then the fairing can be installed and the column assembly is complete.